Chalkboard paint can add a design edge to any room in the house–and make communicating a lot more playful too! From large hand-drawn murals to delicate labels on bottles and jars, chalkboard paint offers endless opportunities. It also makes schedules and to-do lists more fun. 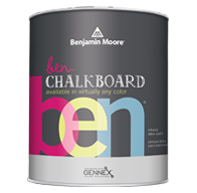 Benjamin Moore's ben® Chalkboard, available in thousands of colors, makes it all possible. Chalkboard paint lets you unlock your creative side. Incredibly flexible, a chalkboard surface can even act as a dynamic substitute for art. • Let a chalkboard wall stand alone as an accent or feature wall in any room. • Add whimsical architectural details like hand-drawn moldings to a communal wall. • Turn tables into an empty slate for art or games. • Labels look better using chalkboard paint– storage boxes, cabinets and drawers, serving trays, planters, vases…the list is endless! Edit and erase as you go: Chalkboard paint is specially engineered so that chalk wipes off easily, giving you a clean and colorful canvas, time after time. Sure we’re all digitally connected, but nothing beats a quick “at-a-glance” visual of the day ahead. From shopping lists to tracking fantasy football, a chalk wall helps strengthen communications with a heavy dose of fun! Paint a calendar along the entryway in eye-catching Million Dollar Red 2003-10 to give family members a last reminder of their day as they head out the door. 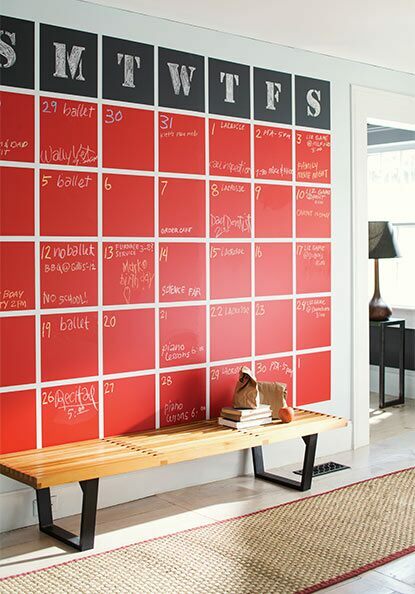 Chalkboard paint colorfully merges work and life, allowing you to ideate on the go. You can create erasable chalkboard walls in any one of our premium 3,500+ colors; here’s a small sampling. Just as chalkboard paint can make your life a little easier, the formulation of Benjamin Moore’s ben® Chalkboard paint makes painting chalkboard surfaces as easy as possible too. 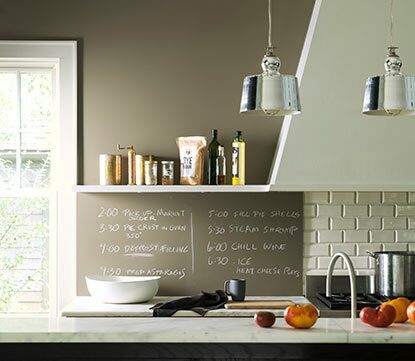 Our ben Chalkboard paint is a DIY favorite, formulated for easy application. It’s also available in thousands of colors. Goodbye green or black chalkboards, hello designer-quality color. Little ones are going to draw on the walls anyway—chalkboard paint provides a strategically placed space for them to dream in color. However, kids shouldn’t be the only ones to get in touch with their inner artists. Shelves painted with chalkboard paint presents a cool way to label items with hand-drawn illustrations – think a leaf for herbs or an apple for fruits. Empty decorative frames open an invitation for guests to fill in doodles, anecdotes, or words of inspiration–all with artistic flourish. And with ben Chalkboard paint available in smaller quart sizes, you can easily experiment in a range of colors. Transform almost any interior surface, in over 3,500 colors, into an erasable chalkboard–and let creativity take flight. Need to Hire a Painter? 4 quick steps to finding the perfect painting contractor.